This year, we were lucky enough to have James Nation, Head of Design and UX at Beano Studios, as our keynote speaker. James is head of the team that took home the Best User Experience in 2017, so it was great to have him speaking through about how he managed to design a cutting-edge, online experience for a young audience. The 2018 UXUK Awards was a night of two halves – one, celebrating the innovative user experiences created by organisations who want to make a positive impact. So, with that in mind, it was fitting that Calm Harm – an app created to help teenagers resist or manage the urge to self-harm – took home not only the ‘Best Not-For-Profit’ award, but also the biggest award of the night: Best User Experience. The Not-For-Profit category was one of the categories our judges found the hardest to call, with fantastic entries from Samaritans, Pride in London and many more. View the full list of winners here. 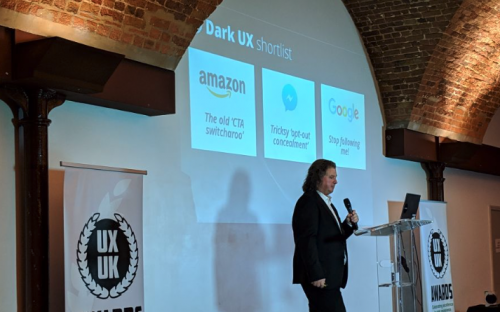 The other half of the evening was, of course, shining a spotlight on organisations using UX to manipulate and confuse users through our Dark UX Award. The three entries that made our final shortlist – Amazon, Facebook Messenger and Google – are no strangers to controversy. Ultimately, Amazon was voted the “winner” by the audience, who felt their use of colour theory and micro-copy in calls to actions was truly nefarious. As always, we’d like to say thank you to everyone who entered, attended, and of course, our sponsors. A huge thanks is also due to our fantastic judges, who did not have an easy job deciding between so many entries of such a high calibre. And, of course: congratulations to all of our 2018 UXUK Award winners! We can’t wait to see what 2019 has in store for UX. If you’d like more information about sponsoring, entering or attending the UXUK Awards 2019, please contact Jo Hutton at jo@uxukawards.com. Have a look at our Twitter and Facebook page for more pictures of the Awards and all of our updates from the night.